Encounters with Luther offers in one volume original primary research from an international and ecumenical pool of scholars. It examines Luther and Lutheran theological traditions along with their historical foundations and with a focus on relevant contemporary issues and ecumenical collegiality. Topics range from sacraments and marriage to violence and gender and sexuality to spiritual care, politics, and suffering. Chapters are based on the annual Luther Colloquy proceedings at Lutheran Theological Seminary at Gettysburg. 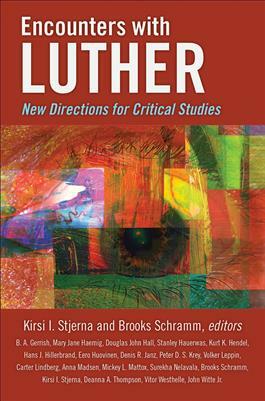 The articles represent a diverse range of authors and methodologies that reward readers with relevant and genuinely contemporary and practical applications of Luther's thought. Contributors: B. A. Gerrish, Mary Jane Haemig, Douglass John Hall, Stanley Hauerwas, Kurt K. Hendel, Hans J. Hillerbrand, Eero Huovinen, Denis R. Janz, Peter D. S. Krey, Volker Leppin, Carter Lindberg, Anna Madsen, Mickey L. Mattox, Surekha Nelavala, Brooks Schramm, Kirsi I. Stjerna, Deanna A. Thompson, Vitor Westhelle, and John Witte Jr.
"Since 1970 the annual Luther colloquy at Gettysburg Seminary has provided a unique forum for discussing Martin Luther's theology and its value for contemporary thought. These essays, based on presentations at the colloquies by a notable array of scholars, enable a larger audience to benefit from a rich sample of Luther's depth and relevance." "The claims in these pages are as bold for our context as Luther's claims were for his. If you are curious about the relationship between Lutheranism and a public church, read this book and encounter Luther anew. Many of these chapters will be required reading in my Preaching Public Issues course." "When helping readers encounter Luther, the voices assembled in this provocative volume sometimes counter him, and other times count on him. Luther appears here as one who cannot be discounted in the search for theological and ecumenical insight for the next decades of church life." "As we approach the Luther quincentenary in 2017, scholars will be hoping for more substantive engagements with the thought of Martin Luther than such commemorations sometimes yield. This volume will meet or exceed our hopes. It brings together the most creative and thoughtful Luther scholars of the present age, theologians, biblical scholars, historians, and ethicists: this is just the kind of team needed to do justice to Luther's enormous and complex legacy." "This collection of essays is intended to provoke further thought and research on Luther and Luther's ongoing legacy. It succeeds by assembling an international and ecumenical group of highly accomplished scholars who address a broad spectrum of topics with an eclectic variety of approaches, some traditional, others unexpected, but all engaging. Anyone interested in Luther will find in this book a deeply stimulating resource and a compelling case for the Reformer's contemporary significance." Amy Wheeler, John Witte Jr.